A close-up of the painted monogram with the initials "LH". 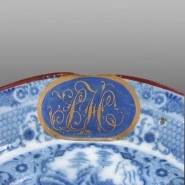 An indented earthenware plate printed in blue with the Net pattern with a monogram painted in a blue ground with gilt lettering in the initials "LH". The rim of the plate is enameled in brown. A rare marked example by the Herculaneum factory.